Have you ever tried going back to the cartoons of your childhood? I have, and it’s been a mix of nostalgia and disappointment. I can watch the same episodes again, but I can’t watch them with the same eyes. I watched some episodes of He-Man and Voltron for the first time in twenty years this year. I was shocked how bad they were. They both offered incoherent, ludicrous story lines, combining visual elements likely to appeal to six year olds with no thought for consistency. He-Man features bare chested warriors with swords next to cyborgs all living in a castle and each episode fighting off a simplistic baddie called Skeletor who is a skeleton in a cloak. The castle is an important element: Voltron has it too, as five astronauts find hidden robot lions to save a princess from an evil alien king. 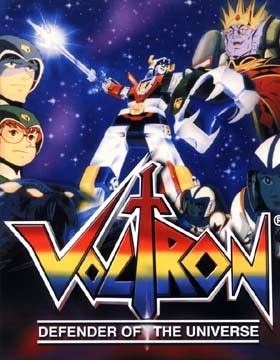 The backstory of Voltron is that the mighty Voltron robot was so powerful that a space-goddess (!) cast a spell on it, splitting it into five different coloured parts, which became robot lions as they fell to the ground, each one falling to an environment relevant to its colour – the green lion to the forest, the blue lion into the water, etc. It takes some keys buried in the king’s sarcophagus (and one stolen by ‘space-mice’) to reactivate the lions. But of course, the team learns that it has to join together into one big robot if it wants to win. It sounds remarkably well designed to sell toys. And it worked – we all wanted all the lions; my brother got the yellow one, and I the green one. It’s no wonder children wrote terrible stories at school. The cartoons they watched were setting a terrible example. Although not all of them – I also rewatched a number of episodes from The Mysterious Cities of Gold, and it stood up much better. It used to be on at 5pm on ABC in the late 80s. It’s an epic story of lost orphans who are taken to South America to find the Mysterious Cities of Gold. It has a lot of moral ambiguity and complexity to some of its characters and it still managed to fill me with some sense of wonder. I hate to think what will happen when I try to re-read the Famous Five. The only childhood book that has stayed with me into adulthood is John Christopher’s The Tripods Trilogy.